Since writing the original post, I used up MAC Sophisto and Strawberry Blonde, all the way down to their inner metal tubes. They're sitting in my Back to MAC empties bag. Even though I have six MAC empties, sufficient to qualify for a free lipstick, I want to try something different. Spice It Up...really didn't get worn that much. It's not quite "it" for me, a tad too dark, too cool and too dry (it's the one MAC Lustre formula lipstick I've tried that struck me as being at all dry). Clinique Apple Brandy is what I'm wearing now, until I can find a replacement for Strawberry Blonde. Said replacement doesn't have to be a similar shade, just one I find versatile. As it is, Apple Brandy is going fast, probably due to the softness of the Butter Shine formula, so I anticipate using it up as well. But I won't buy any more Butter Shines...I find the formula too soft. So where does that leave me? When I started seeking look-alikes for Strawberry Blonde, before I decided to not go with the same shade...I suppose you could say it was eye-opening. For one thing, most of the look-alikes were in the $22 to $24 price range. It's more than I've paid for a lipstick, but then this is the first time in a long time (coughsince discovering beauty boardscough) I've used up lipsticks. I don't buy them that often anymore; what I do buy has to work. 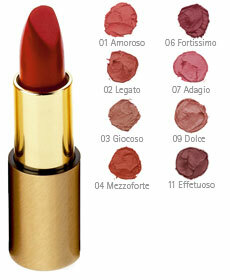 * Dr. Hauschka lipsticks in Amoroso and Adagio. I've swatched these; the colors are actually quite good. It's the formula I can't be sure about, since I haven't worn them properly all day, but they don't seem prone to fading quickly. * Chanel Hydrabase lipstick in Moiré. This is surprisingly wearable, a blend of brick red, plum, twist o' fuchsia shimmer. I'll have to get hold of my sample of this and try it again. But even if I vote against Moiré, I'm already sold on the Hydrabase formula. It doesn't feel moist on, but it's way moisturizing, more so than lipsticks that feel moister on. Plus I like the medium coverage, it's hard to find...more color than a sheer, yet not as high maintenance as full coverage. It's also quite scented (candied rose)--if you're looking for unscented, keep looking, or else try the faint vanilla of MAC. * Something entirely different. Julie Hewett? Kevyn Aucoin? Sue Devitt? Ramy? YSL? Haven't decided yet. I think you should go for Chanel Hydrabase! :) It's the best Chanel lipstick formula, no doubt. Hey, I'm really surprised to say this, but I'm really loving my Cover Girl Tru Shine (I got Wine Shine). the colors are misleading, I could have sworn this would be like this YSL lipstick I have, but this is far superior in color, and the formula is actually quite as good as any highend sheer. And it's almost a fifth of the price. They have quite a few shades similar to what you're looking for, I think. I want more now... as a cheap way to investigate shades to come up with some fall looks, for which lipstick will be major. The colors were blended by the mastermind behind Giorgio Armani cosmetics, Pat McGrath, so they're surprising (shades you might think would not work will), but that's in its favor, I dare say. Audrey: Yep...I'm thinking Chanel Hydrabase too. I've tried only the Moiré one, but I was very impressed. Dain: hermmm...I tried finding this the last time I went to Longs Drugs. All they had was some sort of liquid lipcolor, and the lip-plumping lipsticks.